"AutoSock have been invaluable over recent days to Lancashire's Firefighters. In Bacup, in particular, the firefighters would have been unable to go to two incidents over the weekend without them." "Lancashire Fire and Rescue Service's Firefighters are using AutoSock to help them travel to emergency incidents during the severe weather conditions that have hit the County in recent days. 17 of the Service's Fire Engines and a number of Fire Officer's cars have AutoSock available to them, should they get stuck in snow or icy conditions. The socks are a textile wheel cover that has an elasticated edge, which can be slipped over the driving wheels in less than two minutes. 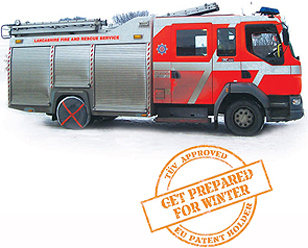 Currently, Fire Engines in Barnoldswick, Earby, Colne, Bacup, Rawtenstall, Haslingden, Burnley, Nelson, Hyndburn, Blackburn, Darwen, Clitheroe, Preston, Chorley, Skelmersdale, Bispham and Lancaster have AutoSock available, however, the Service has just placed an order to make AutoSock available to other Fire Engines based around the County."